The premise of The Return of the Rattler is simple. Four men decide to participate in the Dirtbag Challenge held annually in the San Francisco Bay Area. The challenge involves building a chopper in one month for less than $1000. It needs to be a rideable machine that can run at least 100 miles without breaking down. They have a Yamaha XS650 to work with – the Rattler from the title – but they are complete novices to building choppers, with no prior experience with welding or fabrication. What could go wrong? The movie is a riot of laughter as you watch the bike evolve from design to final assembly. Our protagonists cuss and laugh their way through all the unanticipated problems they run into. You laugh with them as they mess up, but you also see them learning from their mistakes, thinking through problems and asking for help when they are stuck. Somewhere down the line, you realize that they have passed on to you the secret to creating anything new. Film maker Paolo Asuncion likens the process of building the bike to his own journey of questioning the belief system he grew up with. “I was put together a certain way but the stock parts didn’t work for me anymore.” he says. As with the Rattler, he had to figure out which parts of that system to keep, which ones needed to be swapped out with something different, and which ones needed to be created from scratch. Moments of reflection like these are interspersed throughout the movie, breaking up the laugh-a-minute ride and keeping it grounded. You also get to see builds from other participants in the challenge – a Honda CM400 with modified beer bottles for headlamps, a 750 Monster with a girder front end – and understand how much the end vision can vary between builders. The one thing they have in common though is that they want their bike to be like nothing else out on the road. They talk about how satisfying it felt to build something real and tangible, and to ride something that they built with their own hands. Their firm belief is that “Anybody can do this.” By the end of the movie you start to believe them. This is a movie with soul. You laugh, you learn, you grow, and you come away thinking it’s time to go get a project bike and start wrenching. All you need is a vision, a garage, and a buddy or two by your side. This is a story of four French women who fly to India and ride across the Himalayan mountains on rented Royal Enfields. Women riding across the Himalayas is not a new thing – the Indian all-women motorcycling group Bikerni last did it in 2010. Riders from various countries have done it over the years. For those of us who haven’t yet ventured out there, this film is quite thrilling to watch for some of its incredible footage of gorgeous scenery and the dizzying roads the group traverses. The movie begins with the four women starting their journey wearing three-quarter helmets, flowing scarves and regular street clothes – no real motorcycling gear between them. You wonder if you’re in for a very short movie because they’re probably going to bite the dust any minute now. As they climb in altitude, you see them adding more layers to keep warm, to a point where one of them is wearing seven t-shirts underneath her flimsy jacket. You wonder to yourself – “Did they just wake up one morning and think – ‘I think I’ll go ride the Himalayas today'”. Yes, that is a Legally Blonde reference. After the first 45 minutes, you get over their poor clothing choices when they start traversing some incredibly difficult roads. You see them riding down rocky roads with sheer cliffs that make you dizzy even from the safety of your theater seat. You see them dealing with altitude sickness, freezing weather, rockfalls, and some of the most challenging roads in the world. All you can think is – respect! By the time the credits roll, you know what kind of person you are – the kind who can’t wait to book a plane ticket to India and rent a Royal Enfield, or the kind who is happy to live vicariously through the people who thrive on this kind of adventure. Our ladies have earned some solid street cred and you can’t wait to see what their next adventure is going to be. Dirt bikers and brothers James and Steven Beatty ride off-road across the Trans-America Trail – a different type of classic American road trip. They ride 5,000 miles from Tennessee to Oregon before reaching their final destination at the Pacific Ocean. Along the way, they ride across forest service roads, gnarly single track trails, slippery water crossings, and get caught in quicksand. They deal with crashes, injuries, getting lost, and breakdowns. 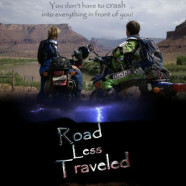 This is a must-watch for those who hope to do the Trans America trail someday. In one breathtaking shot, one of the riders narrowly missing a wild horse that runs across the trail. Another scene shows James working on his bike and getting indirectly zapped by lightning. The movie does have its weaker points. The first hour is an entertaining narrative that focuses on the riding and the scenery and brings the viewer with them. Towards the end though, it breaks down into reality TV style melodrama, taking the focus away from the riding. The protagonist’s struggle to deal with his father’s death and seeking to expunge those demons during the ride frequently struck a false note, something that could easily have been remedied with a better voice actor. In spite of all this, the movie is worth a watch for the first hour alone. I just got home from watching One Crazy Ride, a movie made by Gaurav Jani, an Indian documentary filmmaker who makes motorcycling adventure movies. I was first introduced to his work by Vagabiker, who lent me Riding Solo to the Top of the World when we first met and I was recuperating from my crash in the Yukon. If his intention was to hasten my recovery by showing me motorcycling movies that made me chomp at the bit to get out and ride again, it worked like a charm. Riding Solo was remarkable in so many ways. Filmmaking is a profession that is almost unheard of in India for the average person, in spite of the fact that it hosts the biggest film industry in the world. Rarer still is the use of motorcycles for touring as opposed to commuting in busy cities. The idea of combining the two on a barebones budget makes this man and his work truly unique. The movie followed his solo ride from Bombay to Ladakh in northern India on excruciatingly difficult roads unveiling region that most of the world barely knew exist. For someone like me, having led a fairly insular life in Bombay and rarely having the opportunity to travel within India, it was an eye-opener and a delightful insight into the unparalleled beauty of this country. In One Crazy Ride, Gaurav Jani takes on a similar challenge, this time along with four friends, all part of a group called 60kph. 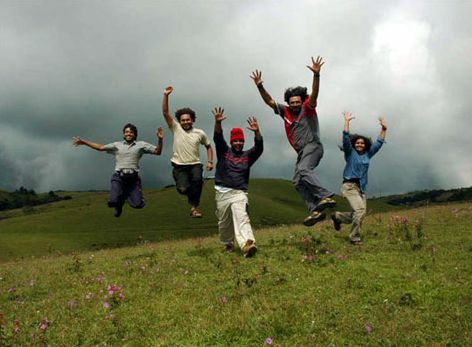 The aim of this intrepid group of adventurers is to navigate through the north-eastern state of Arunachal Pradesh, making their way to the easternmost point without going over paved roads that went through Assam, the state bordering it on the south. Arunachal Pradesh is a state that even most Indians aren’t very familiar with, it being mostly skimmed over in geography books when we were little. This is demonstrated eloquently as they rode through tiny villages and tribal settlements and encounter local people who had no idea what lay even a few miles outside their village. Most of the route is by necessity off-road on roads washed out by mudslides, some littered with rocks and boulders, some slick and muddy from the rains, and occasional river crossings. On the way they encounter villages and tribespeople living traditional lives that haven’t changed in hundreds of years. What makes their achievement truly commendable is the fact that they all rode heavily loaded Royal Enfields, bikes and equipment that make the average off-road bike on roads in the western world look like rocket science. It lays to waste the belief in most people’s minds that they need the latest, most expensive bikes in order to go “adventure riding” a marketing term if ever there was one, because when was riding a motorcycle ever not an adventure? The movie is replete with unforgettable sights and gasp-inducing moments. One that stands out is of the group standing at the top of a mountain range and looking down at clouds floating beneath them like ocean waves. One of the stellar scenes of the movie showed Gaurav walking along a long, narrow, rickety bridge high over a river with flimsy woven rails flanking each side. This brief reconnoiter is followed by him riding his motorcycle slowly and excruciatingly over the bridge. The stress and strain of the five long minutes it took him to cross the bridge was so palpable that when he was done, there was a unanimous burst of applause in the audience. Riding Solo was remarkable in so many ways. Filmmaking is a profession that is almost unheard of in India for the average person, in spite of the fact that it hosts the biggest film industry in the world. 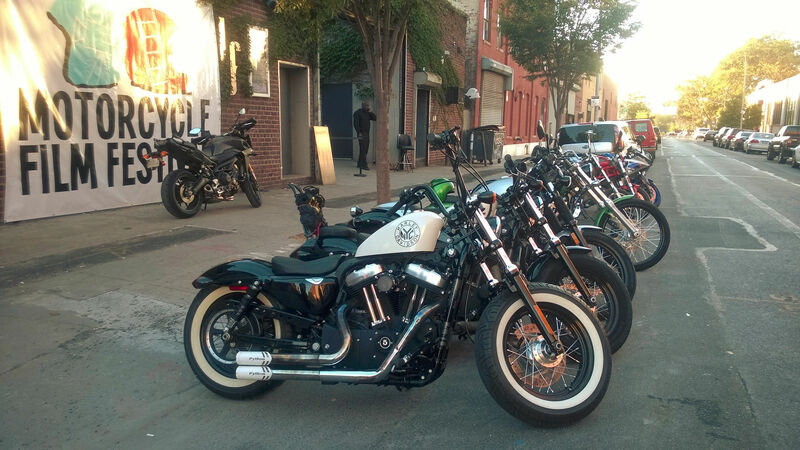 Rarer still is the use of motorcycles for touring as opposed to commuting in busy cities. The idea of combining the two on a barebones budget makes this man and his work truly unique. 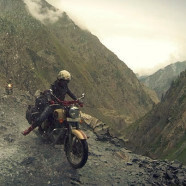 The movie followed his solo ride from Bombay to Ladakh in northern India on excruciatingly difficult roads unveiling region that most of the world barely knew exist. For someone like me â€“ having led a fairly insular life in Bombay â€“ and rarely having the opportunity to travel within India, it was an eye-opener and a delightful insight into the unparalleled beauty of this country. Most of the route is by necessity off-road on roads washed out by mudslides, some littered with rocks and boulders, some slick and muddy from the rains, and occasional river crossings. On the way they encounter villages andÂ tribespeople living traditional lives that haven’t changed in hundreds of years. What makes their achievement truly commendable is the fact that they all rode heavily loaded Royal Enfields, bikes and equipment that make the average off-road bike on roads in the western world look like rocket science. It lays to waste the belief in most people’s minds that they need the latest, most expensive bikes in order to go adventure riding â€“ a marketing term if ever there was one, because when was riding a motorcycle ever not an adventure? I just finished watching The Road Racers for the second time this week. Apparently it seems to be a little known movie as there are no reviews for it on that Amazon link, and a web search didn’t reveal anything from the title alone. Sadly enough, both Frank and Mervyn died in high speed crashes in the space of a year. As did Joey Dunlop a few years ago, although he at least, got to live a little bit longer and enjoy his fame and glory. The Great Escape: All I can wonder is why did I wait so long to see it?? It’s WW2 related plus it’s got motorcycles!! The movie is set in a WW2 prison camp where the prisoners (Allies – American + British) are treatly exceedingly well by the Commandant and German soldiers in the camp – a fact that just did not make sense to me throughout the movie. In hindsight I suppose it does make some sort of a twisted sense – the prisoners were POWs and not Jews. (It’s also a little sad to think of times of war when Americans were the good guys and looked up to by everyone as true heroes.) The Germans just want to sit the war out in the camp where it’s safe, while the Allied soldiers try their damndest to upset this idea by devising new and desperate ways to break out. It’s a longer than average movie and inspite of the theme, it failed to hold my attention until Steve McQueen comes into the picture. Now here’s a man who personifies every Alistair MacLean hero I ever read about. He radiates charisma and I couldn’t tear my eyes away from the scenes in which he appears. As for his motorcycling scenes where he did practically every stunt (he even played the German soldiers chasing himself on motorcycles :P) except for that timeless scene of him jumping the 12 foot tall fence toward the end of the movie, all I could do was go omg omg omg OMG. I believe this is where the last traces of my fascination with cruisers fell away – no away could I do any of the things he did on a cruiser!! (I am now obsessed with dirt bikes and enduros). Faster: While On Any Sunday, a very similar movie, didn’t really do anything for me, this one had me watching from start to finish with a mixture of awe and envy as I saw the limits to which a human can push a motorcycle. I really need to start watching MotoGP one of these days. Out of all the racers shown, I must admit I am more of a Valentino Rossi fan – everybody likes a winner, right? And here’s where I consciously made the decision to get a new bike that would be track-worthy. On a personal level, I also couldn’t rid myself of this underlying feeling of anger at the thought that here’s a world that will never be open for someone like me. I wonder how many talented female racers are denied the opportunity to break into this world due to lack of sponsorship. :| This is one of the biggest reasons why after 5+ years of being a rabid Formula1 follower, I finally quit watching. I think it all started in some F1 rag I was reading that did a story on Jarno Trulli’s wife – a racer in her own right, who quit after a few years of trying to get a break. The writer of the article said something on the lines of – “she finally accepted that racing was a man’s world and there was no place in it for her”. And no, the writer wasn’t angry on her behalf, rather he was applauding her sensible decision to quit and settle down and be a good little wife. The movie was splendid though, even if it was more of a documentary of sorts. Long Way Round: I had expected this one to be a movie, but it turned out to be a reality tv show type thing, with Ewan McGregor and his buddy Charlie Boorman riding around the world on their motorcycles – starting from England, going through Europe, Russia, Mongolia, Canada, Alaska and finally winding up in New York. Unlike Faster, this one at least is something most of us motorcyclists can dream of doing somewhere during our lifetimes. You get to see past Ewan McGregor the moviestar and see the Ordinary Joe/Jill who gets giddy about motorcycles and is happiest in his saddle, going through strange places and meeting new people. I was a bit disappointed to see that they had a big-budget backup crew help them across some of the stickier areas. I also wonder, why on earth would a guy like him want a FREE MOTORCYCLE from BMW? To summarize, I loved this entire series, until the part where they got to America, where it suddenly became much less exciting, and more of going through the motions to finish. In any case, watch this!